After intensive work over the course of nearly a year, the Board of Direction at its October meeting in New York voted to realign the Society’s strategic initiatives as it also reaffirmed continuing efforts. 3) Raise the Bar, the Society’s effort to align engineering education with a changing world. Added to that leadership initiative is a new look at efforts to attract youth to civil engineering careers. The ASCE strategic planning process follows an ongoing cycle in which the Board scans the environment every few years to update its “radar screen.” Radar screen issues are those that the Board considers the highest priority at this moment and that meet three criteria: 1) fall under ASCE’s mission; 2) have the greatest impact on the profession and the ASCE membership; and, 3) offer the potential for ASCE to act on effectively. After prioritizing these issues, the board selected those that warrant strategic emphasis. During this recent process, the Board conducted a series of strategy sessions at its meetings while also conducting outreach to ASCE committees, Region and Section/Branch leaders, the Institutes, the Industry Leaders Council, senior staff and other stakeholders. The strategic initiatives adopted by the Board will be assigned to the appropriate ASCE committees and staff to recommend desired outcomes and action steps. It is anticipated that the Board will consider these aspects at upcoming meetings in January and March. During the October meeting, the Board also approved a new public policy statement and revisions to 11 existing policies. The Board also consolidated three existing policies into one. The new Policy Statement 547 “Engineering Experience for Professional Licensure” was part of a concerted effort by the Committee on Licensure and the Committee on Advancing the Profession to review and update all ASCE policies that address licensure. In all, 10 of the revised policies dealt with licensure-related issues. All ASCE policies are available to read online. The Committee on Technical Activities (CTA) and the Committee on Education (COE) each held their annual strategic discussions with the Board. 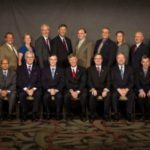 The Board encouraged CTA to pursue deeper relationships with external groups, highlighting the ASCE Aerospace Division’s work with NASA as an example. CTA noted its role this year in the formation of ASCE’s ninth institute, the Utility Engineering and Surveying Institute, as well as the Infrastructure Resilience Division. The Board also discussed the possible inclusion of CTA representation on the Technical Region Board of Governors. The Board engaged in strategic discussions with the Committee on Education focused on ASCE’s continued and active involvement in ABET, the organization that accredits university engineering and technology programs, as well as ways to strengthen efforts to encourage civil engineering STEM activities in middle and high schools. The Board directed the Executive Committee to establish a task committee to study the Geographic Region boundaries, with the goal of reducing the number of Geographic Regions by one. This will seek to more appropriately balance the number of members in each Region while better aligning communities with common experiences and common needs. Currently, the number of members assigned to each Geographic Region ranges from 9,688 to 23,917. I want to congratulate the board for the new alignment in strategic initiatives. Its timely and its going to benefit the members of the society and also help in infrastructural sustainability and environmental friendliness . The alignment of engineering education to the changing world is also a step in the right direction for the future of the Civil engineering profession and professionals.